Alongside the 2014 FIFA World Cup, Neymar has been the biggest news in Brazilian football in the last few years, and one of the hottest topics in Brazilian advertising and marketing too. And now, with his move from Santos to to Barcelona, his stage has moved from Brazil to Europe and, maybe, the world. Neymar is part of a generation of Brazilian players that, despite some very talented names, lacks the quality of Romário, Ronaldo, Rivaldo and Ronaldinho. He is still too young to already be considered part of this pantheon, but Brazilians hope he will get there soon. On the other hand, Neymar is already a phenomenon in Brazilian brand marketing. It’s almost impossible to turn the TV on in Brazil and not encounter him. He is everywhere, in every category: Nike, Panasonic,Unilever, Volkswagen, Santander and six other brands currently count on Neymar´s image to drive their brand and business in Brazil. And now, according to his new management, his next target is international budgets. Mentos, the confectionary brand, was the most recent to announce Neymar as its face in Brazil. They did it last week, at the same time he was signing the contract with Barcelona. Asked about the fact that the player was leaving Brazil, Henrique Veloso Romero, the company’s president, said that it didn’t matter where he’s living or playing, because Mentos is associating its brand with Neymar’s story. Actually, Neymar’s story is part of a traditional Brazilian fairytale of the poor boy who becomes a global football star. The same thing happened to Pelé, Ronaldo and Ronaldinho, and all of them got the attention of Brazilian consumers. That’s the reason why the Brazilian media is doing 24/7 coverage of Neymar´s new life in Barcelona: the arrival at the airport, the clothes he is wearing, the Spanish fans, his girlfriend’s reactions, and so on. In this context his football skills appear to be secondary. No one can question Neymar’s appeal to brands and consumers. He has a good story to tell, bags of charisma, and the skills to score goals and deal with the media at the same time. The problem is that so far no brand has found some white space within the Neymar brand to communicate something unique and different. He is everywhere, but he is always doing the same kinds of testimonial and campaign. Brand managers must consider that Neymar is an asset that carries some very characteristic values – goals, youth, irreverence, parties, beautiful women, trendy hairstyle, fairytale story etc. – but that these values can’t apply to every possible brand, category and strategy, especially when so many other brands are using him in the same way. And there are alternatives! A recent survey asked Brazilians which values footballer and non-footballer athletes convey, and the results were very interesting. 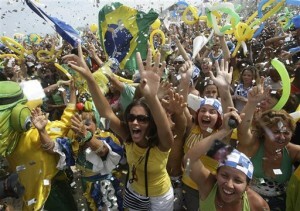 Football players are usually associated with popular values and a Brazilian spirit. On the other side, athletes excluding football are more associated with trust, intelligence, beauty, modernity, and dressing well. Of course Neymar is an exception and can bring many of these values with him, but this research proves that football and football players – in particular Neymar – are not always the answer to brands looking to work with sports in Brazil. Note: Neymarketing is a term coined by our friend and partner Tim Crow. Is Naming Rights Sponsorship In Brazil About To Take Off? 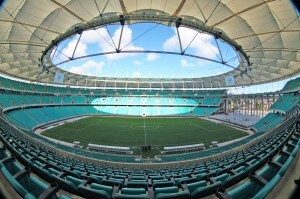 Earlier this month it was announced that Itaipava, the third biggest beer company in Brazil, had become the naming rights sponsor of Arena Fonte Nova, the 2014 World Cup stadium for Salvador in north-eastern Brazil, and the first of the new generation of Brazilian sports arenas to successfully sell its naming rights sponsorship. Despite several previous naming rights sponsorships of concert venues and movie theaters, naming rights sponsorship in sports is still rare in Brazil. Prior to the Itaipava Arena, the only other Brazilian football stadium to have a branded name was Kyocera Arena, of Atlético-Paranaense in Paraná, which was sponsored from 2005 for R$2m per year but discontinued after 2008. The main reason for this is that Globo, the dominant Brazilian TV network, has a policy of not using brand names in its sports coverage. It’s a policy applied to almost everything it covers, and brands usually cite this as a reason why naming rights sponsorship in Brazil is a poor investment. Globo is considering changing its ‘no brands’ policy, on the condition that it receives a percentage of every contract involved. If it happens, this would fuel the naming rights market in Brazil, but Itaipava had other reasons for naming the Arena Fonte Nova. Primarily, Itaipava is opening a new factory in Bahia, close to Salvador, and naming the region’s most important stadium is part of its strategy to connect with local consumers, engage staff and steal marketshare from its main rivals Ambev and Kirin Schin. But also, the deal ambushes Ambev’s FIFA World Cup sponsorship, especially if Itaipava can make the new stadium name stick with consumers and thus sidestep FIFA’s policy of de-branding sponsored stadiums which host World Cup matches. Another interesting fact is the Itaipava Arena financial details: R$ 10 million per year over 10 years – almost 70% more than most estimates expected. Now, there are strong rumours in the media that Itaipava and Allianz are negotiating to name Corinthians’ new stadium in São Paulo for a R$400 million investment (R$20 million per year for 20 years), with Allianz looking most likely. So it seems the naming rights market in Brazil could be about to take off, and that companies are starting to understand that there is much more to it than brand visibility. But the big question, as we’ve said before, is can sponsors make it pay back? This is the second post, originally published on August 10th 2012. When we were thinking of what to write about how Olympic sponsors were activating in Brazil around London 2012, we felt this post would be short! The truth is, for several reasons, this is one of the less activated Olympic Games here. Both brands and consumers seem to already be so focused on the 2014 World Cup and the 2016 Olympics that sponsors seem mostly to have passed on London 2012. 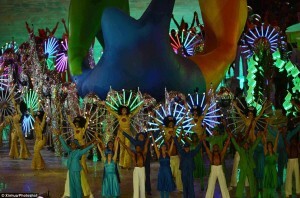 And don’t get us wrong, brands do have a tradition of Olympics activation in Brazil. But this year, things are different. 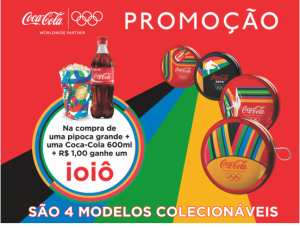 Here are brands in Brazil doing the best job of activating London 2012. P&G has used its ‘Thank You Mom’ Olympics campaign and is also activating at retail. Their message has resonated strongly with Brazilians’ hearts and minds. Coca-Cola re-edited a famous promotion from the 80s and 90s that gives consumers thousands of branded yo-yos, and made them Olympic themed. It’s a good move, but in our opinion a little conservative. Bradesco, the official bank of Rio 2016, is using Brazilian athletes. They have to think long term because their main competitor, Itaú, is a sponsor of the World Cup and is already using football strongly. Sadia, a Brazilian food brand, sponsors some Brazilian Olympic federations (judo, swimming and gymnastics) and created this video mixing sports with fantasy and videogames. For Brazilian sports sponsorship, it’s a very original approach. 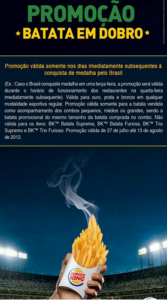 On the other side Burger King has fallen foul of the IOC by ambushing the Games using a promotion involving Brazilian gold medals. But ironically McDonald’s, the Games sponsor who objected to the campaign, are concentrating their marketing eforts here on an Ice Age 4 promotion. In summary, most brands here have failed to create something relevant to consumers using the Games. Almost every sponsor did some kind of activation, but, with a few exceptions, they’re not generating much buzz. Should they have used London 2012 as a link to Rio 2016? We think so. An opportunity missed. Ativa Esporte has recently made a partnership with Synergy, one of the most relevant sports marketing agencies in the United Kingdom and the world. 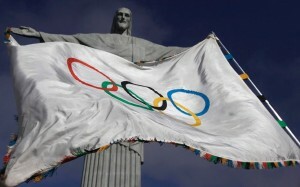 During London 2012 we contributed to Synergy´s blog posting some thoughts about brazilian point of view. This is the first post, originally published on August 2nd 2012. As well as the medals Brazil wins, we are naturally taking a big interest in London 2012 to see what we have to follow. We can’t deny, our heads are already in 2014 and 2016! Brazilians are following London 2012 in a very new way. For the first time in recent history, the Olympics is not being broadcast by Rede Globo over free-to-air TV. For those not familiar with the Brazilian media landscape, Globo is one of the top 4 media conglomerates on the planet, known worldwide for the quality of its delivery. It has also been the dominant media channel in Brazil for decades, regularly attracting huge nightly audiences. Brazilians joke that if something isn’t news on Globo, then it isn’t news at all. When the London 2012 broadcast rights in Brazil bid were tendered years ago, Rede Record made a daring move, outbidding Globo for the free-to-air TV exclusive rights. 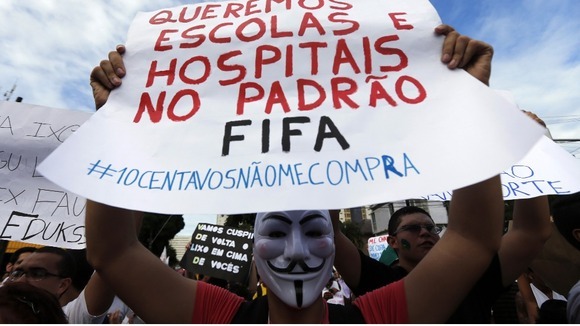 This was a huge development in media competition in Brazil, but it came with implications. Some athletes and sports governing bodies have complained (some more, some less vocally) that, despite alternating in the audience rankings between 2nd and 3rd places, Record’s reach is far smaller than Globo’s. So, in practical terms, London 2012 became less valuable as a marketing platform, so it can be said there is actually less engagement (natural or forced) from the media, and the public, than is normally the case with the Olympics. Before the Games, Rede Record tried to pacify stakeholders, promising a great broadcast. One week later Brazilians are engaging with the games, but not primarily via Record. On the first Sunday of London 2012, Record ranked only third among free-to-air channels in Sao Paulo with 1.1 million viewers, losing out to Globo, with 2 million, and also SBT, a more popular channel which is famous for importing Mexican soap operas, with 1.3 million. Terra’s free HD broadcast over the web is also helping Brazilians engage with the Games, especially during business hours. In this scenario, brands are being challenged to create alternatives to enable consumers to engage with the Games. Step forward – social media!